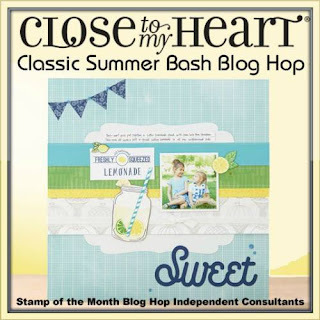 Welcome to the May Stamp of the Month Close to my Heart blog hop. You should have arrived here from Brandi Robinson's blog. There are 25 consultants/bloggers participating this month. 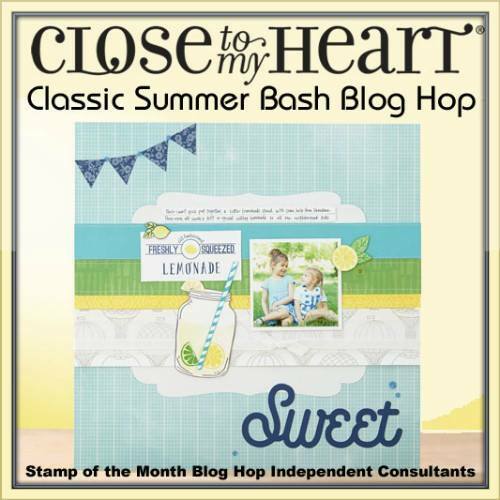 If at anytime you get lost along the blog hop, just point your browser back to Catherine Nowak's blog to go back to the beginning. 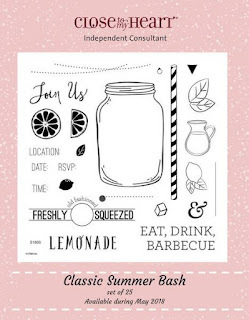 The May Stamp of the Month is entitled, " Classic Summer Bash", and the item number to order is S1805. 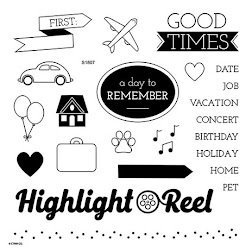 As always, the Stamp of the Month retails for $17.95 plus shipping and handling or you can get it for the discounted price of $5 with a $50 order. Below you can get a better view of each stamp in this beautiful 25 stamp set. For my project, I made a simple 3x3 card using the whole lemon and the word lemonade from the set. Small cards like this can be used this summer to label lemonade as one of the beverages at your family pool parties and summer birthday parties. 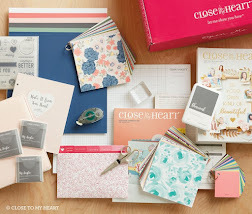 Supplies used include: kraft card stock, lemon exclusive ink pad, sapphire exclusive ink pad, white daisy card stock, smoothie bow from Beautiful Friendship embellishments, and Beautiful Friendship background and texture papers. Thank you for visiting my blog. I welcome your feedback on my project. Now, continue on through the hop. Your next stop is Alyson Mayo's blog. See you next month! thanks Brenda!! It was super fun to make. What a cute card! Love it paired with those papers.